These cards refer to Chokmah. From the point of view of the ordinary person, Chokmah is really No. 1 and not No. 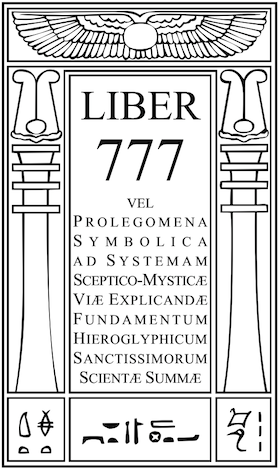 2, because he is the first manifestation; Kether is completely concealed, so that nobody knows anything about it at all. Hence, only on reaching the Deuces does an element appear as the element itself. Chokmah is uncontaminated by any influence; therefore the elements here appear in their original harmonious condition. 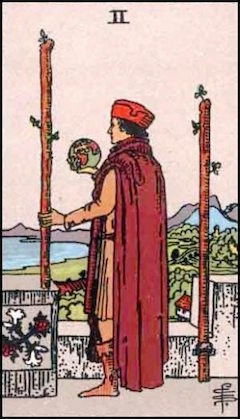 The Two of Wands is called the Lord of Dominion, and represents the energy of fire; fire in its best and highest form. 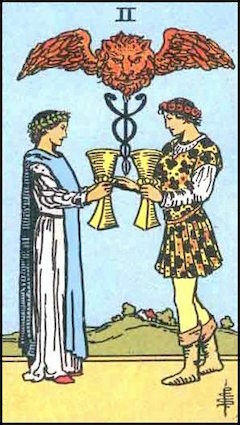 The Two of Cups is the Lord of Love, which performs a similar office for water. 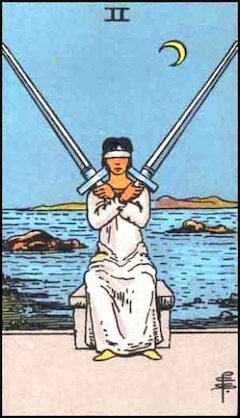 The Two of Swords was formerly called the Lord of Peace Restored; but this word "restored" is incorrect, because there has been no disturbance. The Lord of Peace is therefore a better title: but it needs thinking hard to work this out, since the Sword is so intensely active. It may be helpful to study the Essay on Silence (p. 120) for a parallel: the Negative Form of the Positive Idea. See also the Essay on Chastity (Little Essays toward Truth, pp. 70-74) which concludes: Sir Knights, be vigilant: watch by your arms and renew your oath; for that day is of sinister augury and deadly charged with danger which ye fill not to overflowing with gay deeds and bold of masterful, of manful Chastity. Witness also Catullus: domi maneas paresque nobis Novem continuas futationes. Nor does he misunderstand the gesture of Harpocrates; Silence and Chastity are isomers. It is all one case of the general proposition that the sum of the infinite Energy of the Universe is Zero. 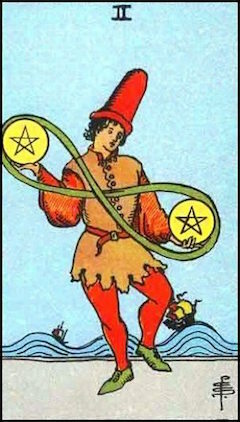 The Two of Pentacles was of old time called the Lord of Harmonious Change. Now, more simply, Change; and here the doctrine must be stated a little more clearly. This suit being of Earth, there is a connection with the Princesses, and therefore with the final Heh of Tetragrammaton. Earth is the throne of Spirit; having got to the bottom, one immediately comes out again at the top. Hence, the card manifests the symbolism of the serpent of the endless band. Almost any male image shows some aspect of Chokmah. The Grades of the Order. Seven Heavens of the Arabs.